At Morris and Bott we offer a selection of quality rental properties in North Devon of all shapes and sizes in a variety of locations to suit most budgets. Whether you are looking to move out of home for the first time, require an extra room for an expanding family or seeking a stop gap while you find your perfect home in the area after relocating, our rental team will find a home to suit you and your circumstances. Our residential lettings team can also work in conjunction with our sister company holidaycottages.co.uk to offer shorter stays in some of the finest holiday cottages in North Devon, whether for an extended furnished winter let or for shorter stays in furnished accommodation throughout the year. Things to think about when letting…..
Where – if your relocating with work and know little about the area, our experienced and knowledgeable team will help you find your right spot. Near the right school? Transport links? 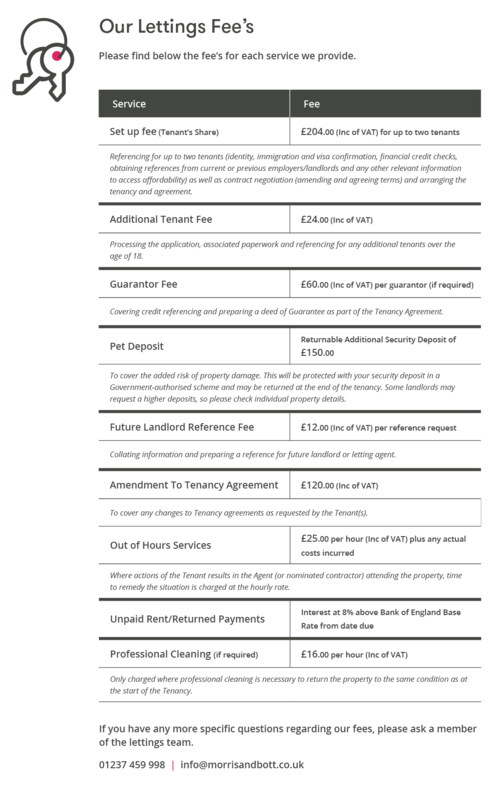 When – the majority of our available rental properties are available on assured short hold tenancies, however we can offer shorter winter lets and working with holidaycottages.co.uk gives us the ability to work if required on weekly or monthly lets to tie you over. Who – not all properties are suitable for everyone, our rentals team have visited each property and will gladly discuss the pro’s and any con’s (all though we are sure they are all perfect) to find you the right property. Budget – like a mortgage, a persons rent is usually their biggest out going and it doesn’t end there, as you will have all the liability of monthly bills to account for. Our team will help calculate the affordability of a home based on your current circumstances. What’s next – speak to our dedicated team that are available 7 days a week in our Bideford Head Office to discuss your criteria on 01237 459 998 and sit back while we find the property that is just right for you.